This was the final event in our three week long Summer Fun events at Queensmere, getting you and your little ones through the Summer holidays with creative activites and entertainment for free! 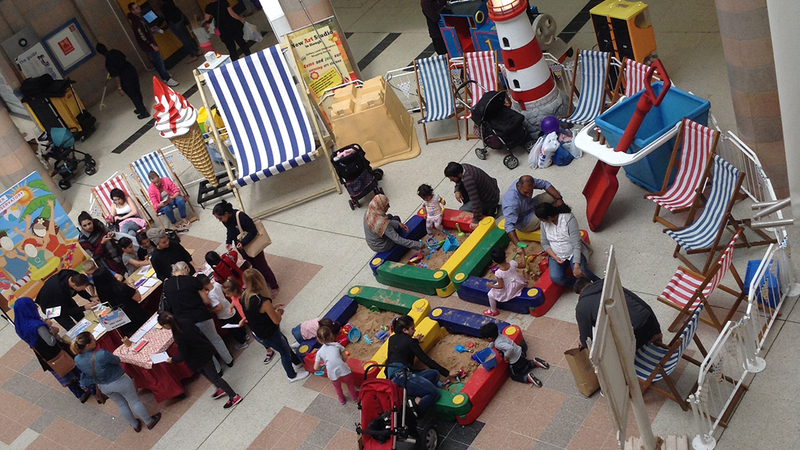 This week we can sand pits in the centre where children (and some adults) could play in the sand all day while others laid back in our regular sized deckchairs. We say regular because we also had a GIANT deckchair where people could take photos. As well as this we had free sand art crafts where you could make your very own beach-themed picture with colourful sand, thanks to the guys and girls at ARTS CLASS GROUP for providing the crafts! But wait… that wasn’t all! We also had a very BIG stilt walking band performing children’s nursery rhymes and modern tunes likes Taylor Swift! If you missed out on these events then make sure you stay up to date with everything we have going on by following us on Facebook or Twitter.